Designed by Hannes von Döhren and Livius Dietzel in 2010. Published by FontFont. FF Basic Gothic supports up to 82 different languages such as Spanish, English, Portuguese, German, French, Turkish, Italian, Polish, Kurdish (Latin), Azerbaijani (Latin), Romanian, Dutch, Hungarian, Serbian (Latin), Kazakh (Latin), Czech, Swedish, Belarusian (Latin), Croatian, Finnish, Slovak, Danish, Lithuanian, Latvian, Slovenian, Irish, Estonian, Basque, Icelandic, and Luxembourgian in Latin and other scripts. Matthew Carter’s Verdana was made for screen reading and works brilliantly within that medium. 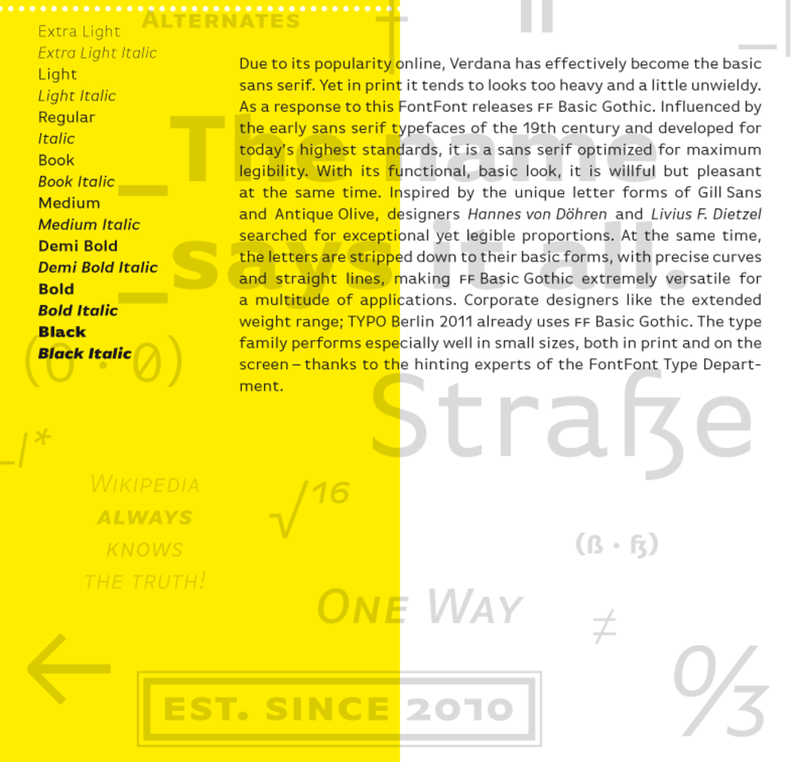 FF Basic Gothic is a response to Verdana in print, where its forms leave generous room for improvement. Influenced by the early sanses of the 19th century and developed for today’s print standards, FF Basic Gothic is a sans serif optimized for maximum legibility. With its functional, basic look, it is unapologetic but pleasant at the same time. Inspired especially by the unique letter forms of Gill Sans and Antique Olive, designers Hannes von Döhren and Livius F. Dietzel searched for an exceptional yet legible set of proportions to serve as the basis for the design. At the same time, the letters were reduced to their most basic forms, with precise curves and straight lines, making FF Basic Gothic extremely versatile for a multitude of applications. Practitioners of corporate design like the family’s extended weight range, too. The family performs well at small sizes, both in print and on screen—thanks in no small part to the hinting specialists of the FontFont Type Department. The heavy weights have higher contrast and unfold their strength at larger sizes, notably in newspaper and magazine headlines. 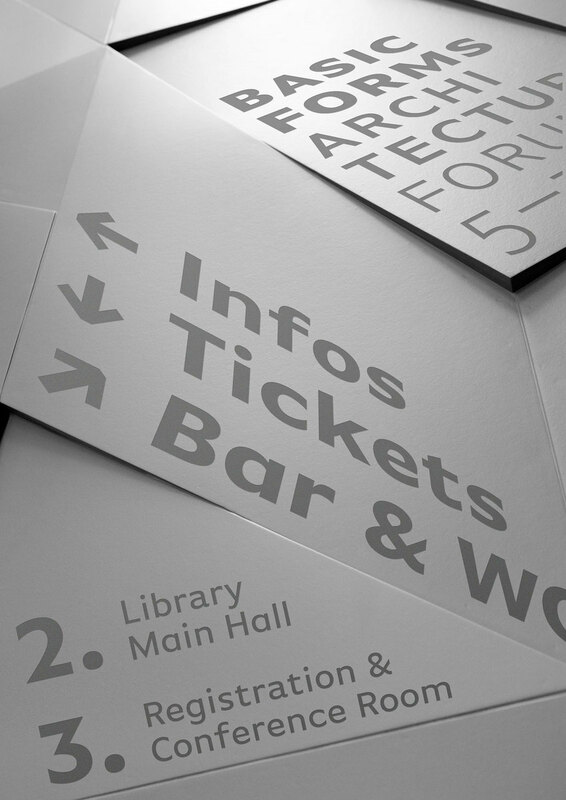 FF Basic Gothic comes equipped for complex, professional typography. The OpenType Pro fonts have an extended character set to support Central and Eastern European as well as all Western European languages. 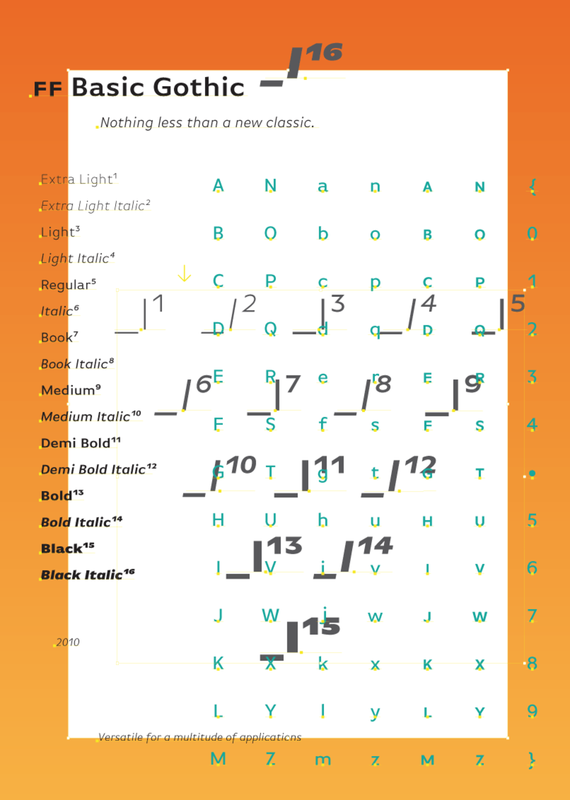 Each style includes small caps, fractions, old style, lining and tabular numbers, scientific superior/inferior figures, alternates, and a set of typographic arrows.